2018 is the Chinese Year of the Dog. The dog is a symbol of prosperity, as the Chinese saying goes, “when a strange dog enters one’s house, it will bring one’s wealth”. It is believed that a dog can also boost one’s good fortune, since the barking of a dog, “wang-wang”, sounds like the Chinese character for “prosperity”(旺). 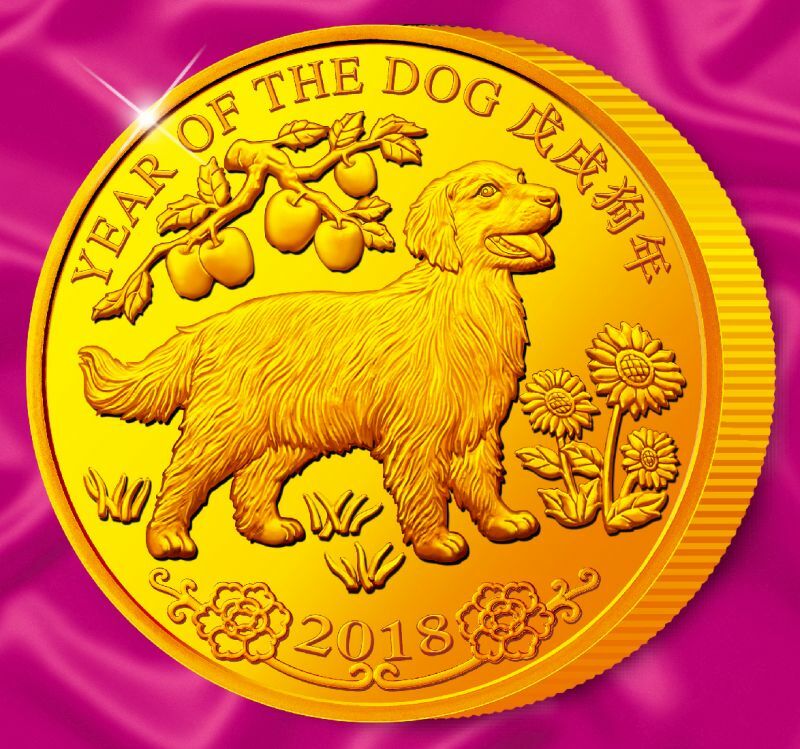 To celebrate this thriving Year of the Dog, the famous Royal Mint has proudly issued the “Hong Kong Year of the Dog Gold Proof Medals” in limited worldwide edition! Sequels to the first yellow gold lunar medal series of the HKSAR, these medals will dazzle your eyes with the intrinsic nobleness and splendour of pure yellow gold! Certain to trigger a craze like its predecessors, these limited treasures will be snapped up soon! Be quick to secure yours! The obverse features an adorable Golden Retriever straightening its neck, to hunt for you riches and luck. The dog stands under a fruitful apple tree, to denote the blessings of peace, happiness and prosperity. Beside it are some blossoming sunflowers, symbolizing a bright future and vitality. 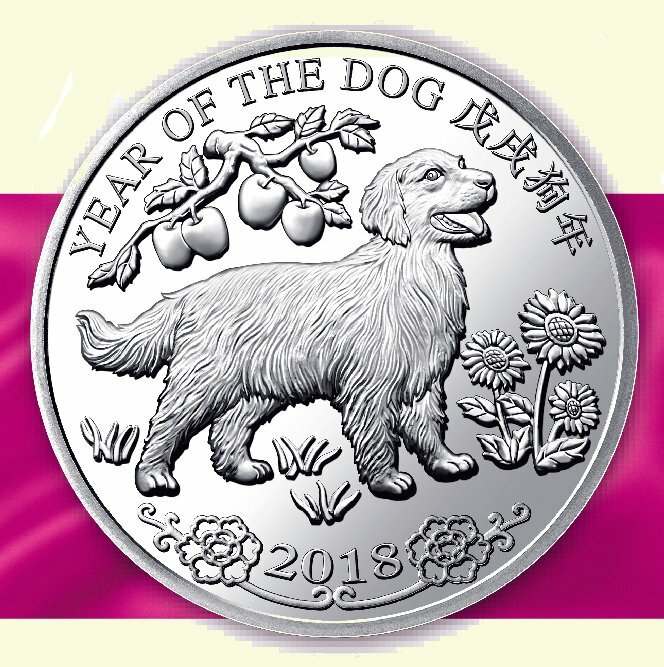 The words “YEAR OF THE DOG” in both English and Chinese are inscribed on the top. The year “2018” at the bottom is flanked by a pair of peony blossoms (the flowers of wealth) entwined with vines, to beckon wealth and longevity. The reverse bears a flourishing view of the renowned Victoria Harbour from the Peak, featuring the two tallest skyscrapers of Hong Kong on both sides of the sea. It demonstrates the splendour of vibrant Hong Kong as the “Pearl of the Orient”, as an international metropolis, as well as one of the world’s most competitive cities. Above the skyline is a blossoming Bauhinia, the city’s floral emblem, to wish Hong Kong and Hongkongers continuous prosperity! The outer ring features a pair of plump ears of grains to denote opulence, with the inscription “Hong Kong Special Administrative Region” in English and Chinese. The Royal Mint is among the oldest coin makers in the world with a history of over 1,100 years! As the sole official minting authority of the United Kingdom, the Mint has successfully launched numerous large-scale commemorative coin programs, including the celebration of Queen Elizabeth II’s platinum wedding anniversary and accession sapphire jubilee, and the centenary of the House of Windsor. Famous for its refined artistry, it has been entrusted by Hong Kong and over 100 countries to strike their coinage. 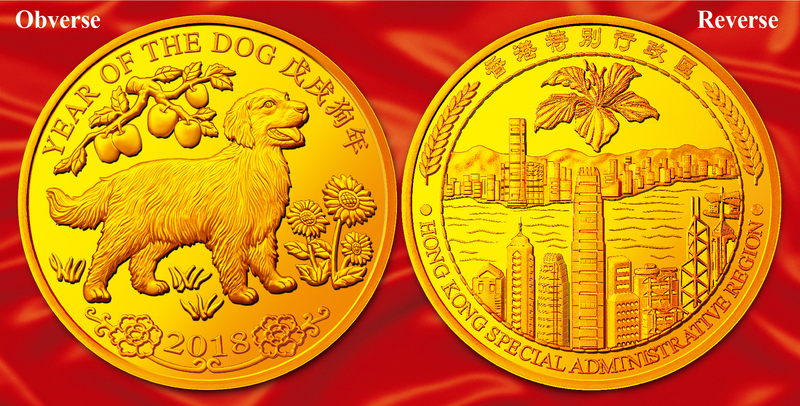 The “Hong Kong Year of the Dog Gold Proof Medals” are from the first-ever yellow gold lunar medal series of this famous Mint. Brilliantly crafted with a combination of traditional hand-engraving skills and modern top-notch technology, each medal exquisitely captures the stunning designs in delicate frosted relief against the gleaming mirror-like background! Such wonderful treasures of art will be treasured for generations! The experienced engraver is painstakingly crafting the delicate design on the die. See, the design is precisely captured on the die in every minute detail! Combining sophisticated craftsmanship and modern technology, each medal is a superb work of art with everlasting value. Comprising 7.78gm .999 fine gold, this impeccable piece of gold should be kept as the heirloom of your family! Comprising 31.1gm .999 fine gold, this resplendent medal perfectly reflects your noble status! Only 950 pieces are allotted to Hong Kong, order now! Comprising 3.11gm .999 fine gold, it exemplifies the Mint’s awe-inspiring craftsmanship! It is a pleasant gift to give for any festive occasions! This sumptuous set comprises three gold medals – “Classic”, “Supreme” and “Delicate”, tripling your good fortune! Only 800 sets are available in Hong Kong, be one of the few lucky owners now! Comprising the Classic Gold Medal, the Delicate Gold Medal and the Elegant Silver Medal, it makes a premium gift for your loved ones! Meticulously struck in .925 silver, this graceful piece of art is a tasteful gift to give away! This 65mm giant medal is struck from 5oz of .999 fine gold! It has the lowest mintage in the series and only 100 pieces are allotted to Hong Kong! A superb, rare gem, it will be gone in no time! This enormous medal is struck from 5oz of .999 fine silver! Only 1,500 pieces are allotted to Hong Kong, don’t miss it out! The lunar medal series issued by the Mint is highly sought-after around the world. 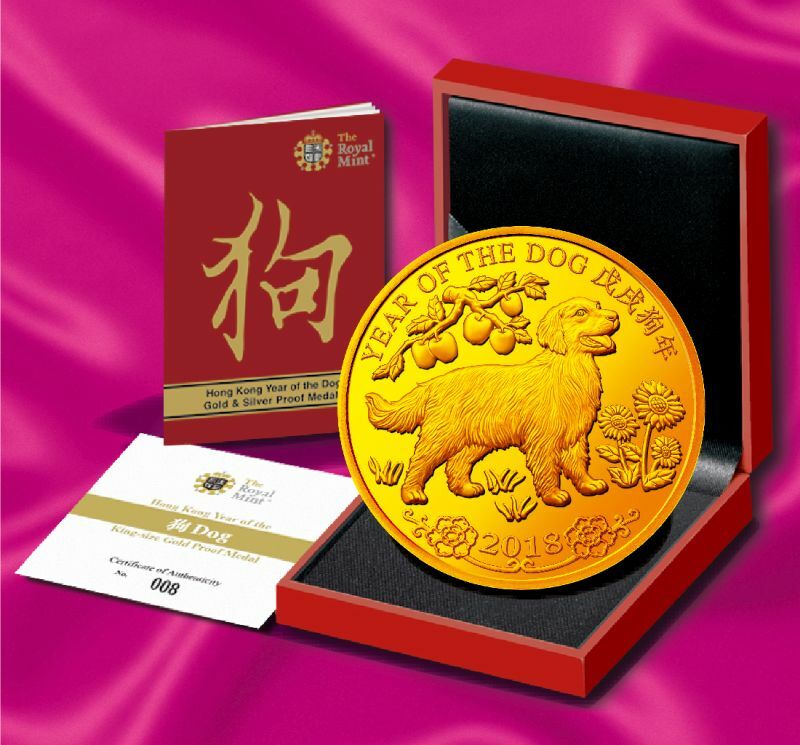 Some previous releases have recorded the following performance: in the "Hong Kong Millennium Lunar Gold Proof Medal Series", the value of the King-size Year of the Dog Gold Proof Medal has once surged to 185%* of its issue price, while the 15.98 gm Gold Proof Medal has once reached 322%* of its issue price (as the chart shown on the right)! With high collectible value, these newly-released Dog Medals will surely attract fierce demand like their predecessors! Act now to avoid disappointment! *The records quoted here are for reference only, and do not indicate future performance. 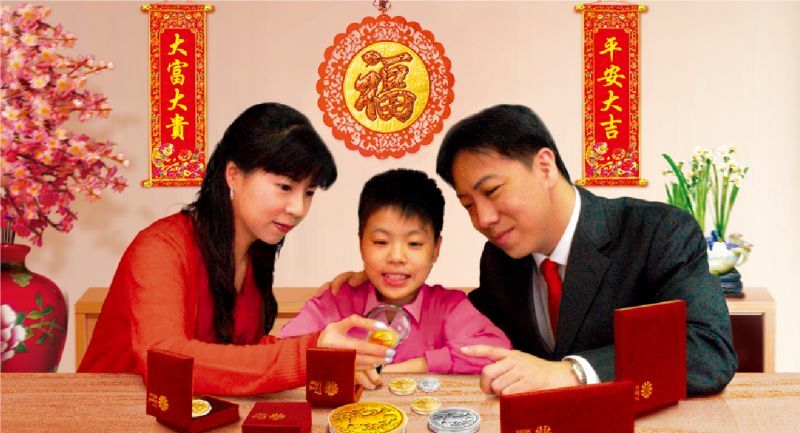 As the first yellow gold lunar medals of both the HKSAR and the acclaimed Royal Mint, the Hong Kong Lunar Proof Medal Series has been feverishly pursued since its debut. Due to customers’ requests, we have now specially searched out a very limited quantity of the previous medals (2012-2017). Grab this extremely rare chance to secure these hot lunar treasures before they are gone soon! The Dog Medal comes in a wide range of configurations for you to choose from. Each medal or set comes with a deluxe presentation box, a numbered Certificate of Authenticity and a Chinese zodiac souvenir booklet, FREE! Not only are they the must-have collectibles for people born in the Year of the Dog▲, but also are perfect for you to keep or to give away as gifts for any festive occasions. 3. 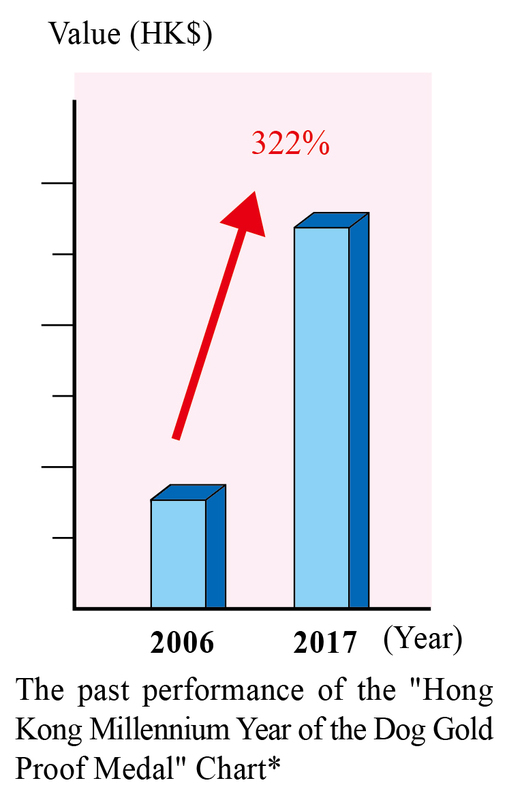 Priority reservation of the next sequel of the same configuration – If you have cumulatively collected all the seven sequential lunar issues (i.e. 2012-2018) of the same configuration, we will reserve the next sequel of the same configuration for you, to make sure you can complete the whole series without any miss. Note: ICL reserves the rights to alter or terminate the above privileges without prior notice. Return the completed order form by WhatsApp, mail, email or fax, Now!